As most iOS developers know, displaying sets of data is a rather common task in building a mobile app. Apple’s SDK provides two components to help carry out such a task without having to implement everything from scratch: A table view (UITableView) and a collection view (UICollectionView). Table views and collection views are both designed to support displaying sets of data that can be scrolled. However, when displaying a very large amount of data, it could be very tricky to achieve a perfectly smooth scrolling. This is not ideal because it negatively affects the user experience. As a member of the iOS dev team for the Capital One Mobile app, I’ve had the chance to experiment with table views and collection views; this post reflects my personal experience in displaying large amounts of scrollable data. In it, we’ll review the most important tips to optimize the performance of the above mentioned SDK components. This step is paramount to achieving a very smooth scrolling experience. Note that most of the following points apply to both UITableView and UICollectionView as they share a good amount of their “under the hood” behavior. A few points are specific to UICollectionView, as this view puts additional layout details on the shoulders of the developer. Let’s begin with a quick overview of the above mentioned components. UITableView is optimized to show views as a sequence of rows. Since the layout is predefined, the SDK component takes care of most of the layout and provides delegates that are mostly focused on displaying cell content. UICollectionView, on the other hand, provides maximum flexibility as the layout is fully customizable. However, flexibility in a collection view comes at the cost of having to take care of additional details regarding how the layout needs to be performed. NOTE: I am going to use UITableView for my code snippets. But the same concepts apply to UICollectionView as well. The table view is requesting the cell that needs to be displayed (tableView(_:cellForRowAt:)). 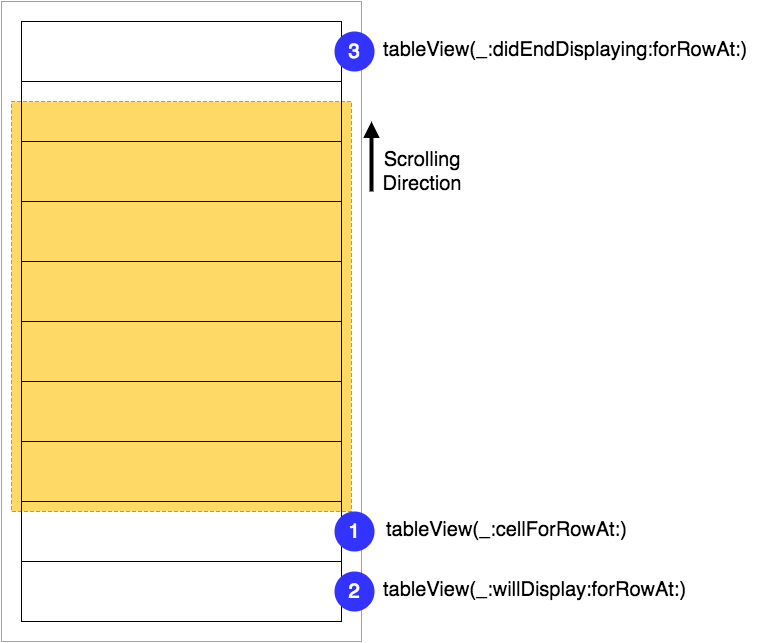 The table view is about to display the cell (tableView(_:willDisplay:forRowAt:)). The cell has been removed from the table view (tableView(_:didEndDisplaying:forRowAt:)). First off, the tableView(_:cellForRowAt:) method should be as fast as possible. This method is called every time a cell needs to be displayed. The faster it executes, the smoother scrolling the table view will be. After fetching the cell instance that is about to be reused (dequeueReusableCell(withIdentifier:for:)), we need to configure it by assigning the required values to its properties. Let’s take a look at how we can make our code execute quickly. Avoid blocking the main thread while fetching data. Updating the table view right after we retrieve the data. Only the when loading the table view the first time, by placing it in viewDidLoad(). Every time the table view is displayed, by placing it in viewWillAppear(_:). On user demand (for instance via a pull-down-to-refresh), by placing it in the method call that will take care of refreshing the data. The choice depends on how often the data can be changing on the backend. If the data is mostly static or not changing often the first option is better. Otherwise, we should opt for the second one. This lets us fetch each image using a background thread and then update the UI once the required data is available. We can improve our performances even further by caching the images. In case we don’t want - or can’t afford - to write custom asynchronous image downloading and caching ourselves, we can take advantage of libraries such as SDWebImage or AlamofireImage. These libraries provide the functionality we’re looking for out-of-the-box. We are using the cached View Model data. We are fetching the images asynchronously. Pre-calculating all the row heights at once. Return the cached value when tableView(_:heightForRowAt:) is called. We can easily customize most of our collection view by implementing the appropriate UICollectionViewFlowLayoutDelegate protocol method. Transitioning to a different Size Class. You can find a small sample with the proposed tips forUITableView and UICollectionView here. In this post we examined some common tips to achieve smooth scrolling for both UITableView and UICollectionView. We also presented some specific tips that apply to each specific collection type. Depending on the specific UI requirements, there could be better or different ways to optimize your collection type. However, the basic principles described in this post still apply. And, as usual, the best way to find out which optimizations work best is to profile your app.